A small but reliable marking, these wingtips are a rich inky black otherwise the birds’ coloration is “a vivid orange-red, almost luminous in quality. The feathers may show various tints and shades, but only the tips of their wings deviate from their namesake colour. As it grows, a heavy diet of red crustaceans produces the scarlet coloration. 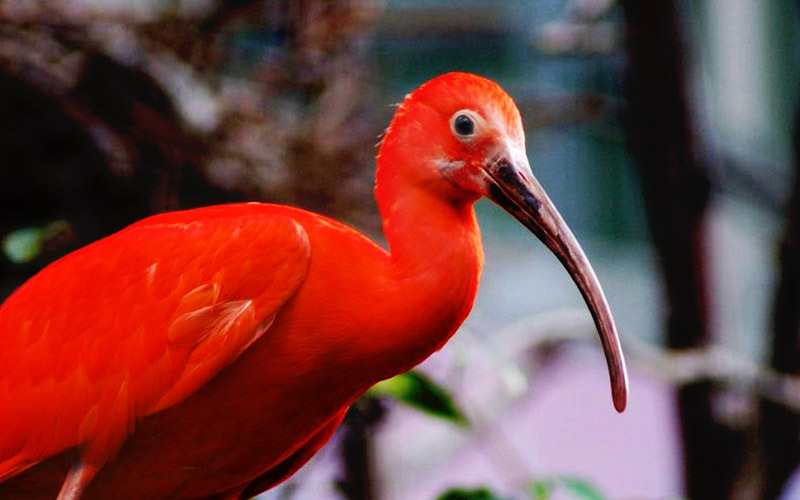 The scarlet ibis is the only shore bird with red coloration in the world. Though it spends most of its time on foot or wading through water, the bird is a very strong flyer, they are easily capable of long-distance flight. They move as flocks in a classic V formation. The Scarlet Ibis use their long, thin beaks to probe for food in soft mud or under plants however they do eat shrimp, small crabs, mollusks and other crustaceans.